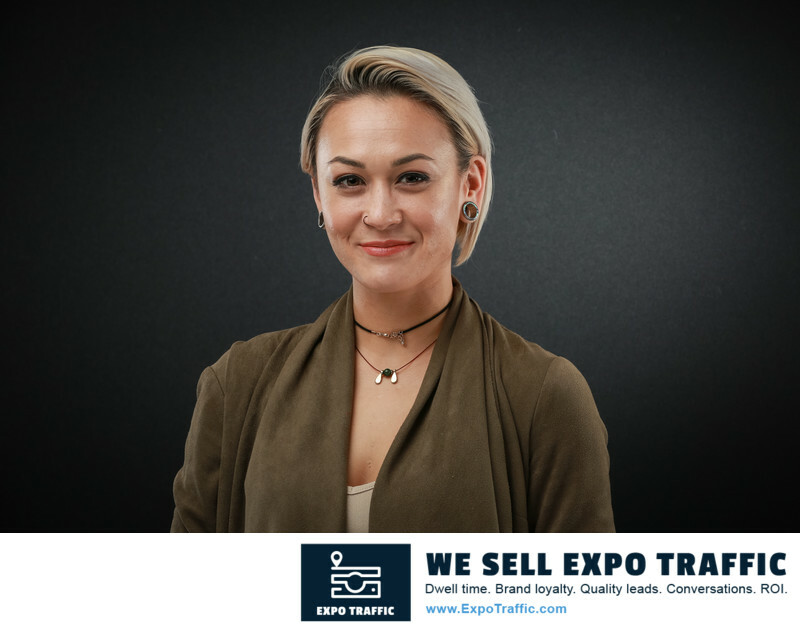 Everything you ever wanted to know about attracting THE LONGEST LINES AND DWELL TIMES to your EXPO BOOTH THROUGH HIGH QUALITY, STUDIO-LIT, ON-LOCATION HEADSHOTS WITH REAL-TIME SOCIAL SHARING, but were afraid to ask. I see lots of headshot lounges on expo floors and they're not busy. So do we. That's because those timid headshot productions suffer a cascade of failures because they are too small. They don't offer real-time social sharing, so their photos never go viral w/in the conference / tradeshow / expo. The booth is too small to accommodate great BIG 5-point lighting, so even if they do offer social sharing nobody wants to share a badly lit headshot. The photographer is too close, so s/he has to use a wide angle lens that adds weight and width to every guest. The photographer may not have the maturity, personality and social skills necessary to connect with hundreds of people every day, drawing out their best expression. The photographer may not have the experience nor commitment necessary to see and direct each person to their best face, best shape. What if all I want is great headshots in my booth - as a 'thank you' - without any of this social sharing mumbo jumbo? And I don't care about long lines to my booth? We totally understand. And we offer a service that is called Just Great Headshots. It is significantly less expensive than our Expo Dominator package. And while guests can still preview their headshots on iPads, there's none of the whiz bang social sharing, yet exactly the same high quality, high speed headshots that your guests will cherish and associate to your brand. Our Just Great Headshots option is perfect for after-show parties and when VIPs and execs are all in one place at the same time. That depends on if your goal is to attract the longest lines on the tradeshow floor to your booth? or if your goal is to just offer great headshots to your visitors, with no expectation of long lines and dwell times. EXPO TRAFFIC TRADESHOW DOMINATOR: at least 15' x 20', plus room for crowd management. Typically we are placed in the foyer outside of the expo floor near registration, or next to a primary anchor exhibitor. JUST GREAT HEADSHOTS: at least 15' x 12'. On average how long do people wait in line? Why would anyone take 90 minutes away from an expensive conference just to wait in line? If the head shots are not of very high-quality, and if there is not real time social sharing that allows the headshots to go viral within the conference, people won’t wait around. People from all over the world however will wait 30 to 90 minutes for a very good headshot because they know it will cost them $300 to $500 to get a very good headshot back home. The sponsors who hire me realize that in a way it’s like they’re handing out $500 bills. Hence the huge lines. How many photos do you take of each guest? At least six. For guests who are very comfortable in front of the camera and who look good in every photo I've taken, I will take at least six photos: two on the left side, two on the right side, and two facing the camera directly. I'm looking for their best side, their best shape. For those guests who are less comfortable in front of the camera I will take as many as twenty or more photos until we get at least one or two that I think are really good and very usable on Linkedin and company websites and such. How much time do you spend with each guest photographing them? About 2.5 minutes on average. How many guests can you photograph each day? In a full 8-hour day we can get to 150 to 200 people or more, per photo bay. For higher volume and speed consider having us bring in multiple photo bays and multiple photographers. While we always provide a stylist with a lint brush, a hairbrush, and a mirror, who is looking for spinach in the teeth, necklaces that are askew, crazy fly-away hairs, spots on their clothing, etc, we don't recommend full hair and makeup as it slows the pace down significantly, thereby reducing the number of people we can photograph and you can engage in conversations. If you insist upon hair and makeup we recommend at least two HMU artists, and of course we will provide that service, for a modest fee. Do your photos go through some sort of beauty filter, like on Instagram? Our lighting is so good that most people see no need to apply filters like that. All the photos you see in the portfolio on this page are straight from camera. Do you offer professional re-touching? Yes. When you retrieve and download your high resolution photos from your event's friendly URL (e.g., http://rebrand.ly/think2018) you'll see an opportunity to purchase professional headshot retouching. Why do you need so much room? A big footprint is one of the five secrets to enjoying the busiest booth. Small headshot lounges suffer a cascade of failures that result in no line, no dwell time, empty booths and SAD FACES all around. What are the five secrets to having the busiest booth on the trade show floor? An experienced photographer skilled in the art of directing every guest to their best shape, best face, best expression in 2 minutes, hundreds of times a day for several days in a row. Excellent 4-point / 5-point lighting. The lighting must not only be excellent. It must also be something of a spectacle, create something of a scene, be its own attraction. Accommodation of a long portrait lens, at least 100mm, to thin and flatter each guest. This requires at least a 10 foot run. Multiple social kiosks of different sizes to enable real-time social sharing + room for all the required networking gear. Do you require power and a hard internet line in your booth? We do require power, 120 volt, roughly 20 amps. And while we bring our own LTE cellular radio internet router, a hard ethernet line provided by the hotel or convention space can sometimes be faster and more reliable, resulting in faster texts and emails to guests and a better experience for all. 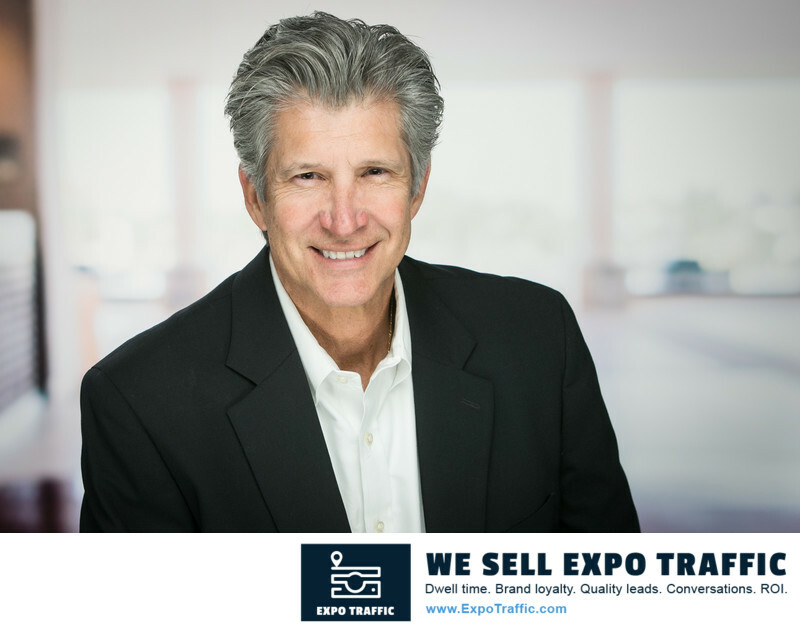 What kind of marketing services does your Expo Traffic headshot lounge provide? Branding, logos, and hashtag messaging of you and your sponsor can be promoted in every photo we generate. Or photos can go out with no watermarks. We offer real-time social sharing of every headshot, including whatever Watermark, logos, branding, hashtag messaging you want to all the major social networks (Facebook Twitter Instagram), plus to peoples' SMS text, and email. We find that the last two (SMS and email) are the most popular. We also offer printing, which is surprisingly popular. Finally, all the photos are posted to an online download gallery with no watermark, no branding of any sort, for your guests to download at highest resolution for use on their LinkedIn, their blog, magazine headshots, whatever. It depends. 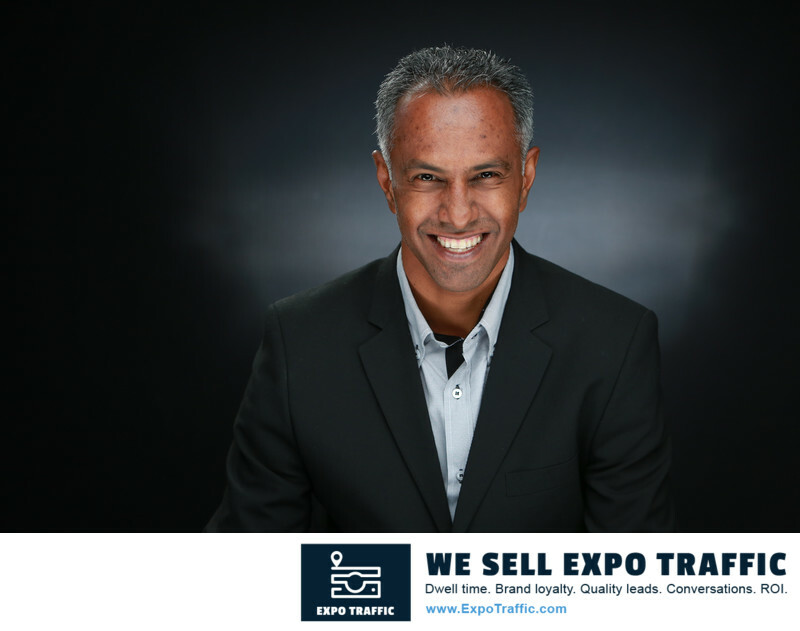 If all you want are excellent headshots that you can give away to those who visit your booth or after-expo party with no social sharing, our prices begin at $2,900 per day. On the other hand if your main goal is to attract the longest lines with the longest dwell times - to have the busiest booth on the trade show floor - then our prices begin at $7,999 per day. The Day Rate is lower for engagements that are longer. For example a 3-day engagement is only $5,999 per day. Why would any Expo Producer or Sponsor want to spend so much money on a headshot lounge?